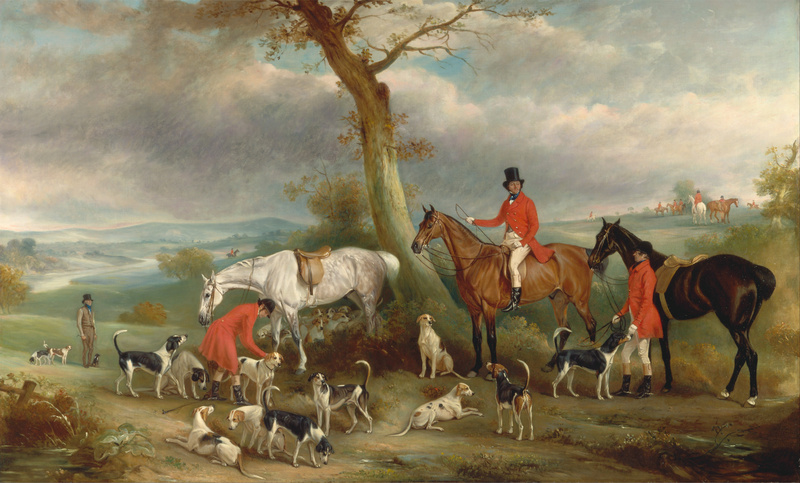 Foxhunting: Encouraging Hounds by John Frederick Herring, 1839. 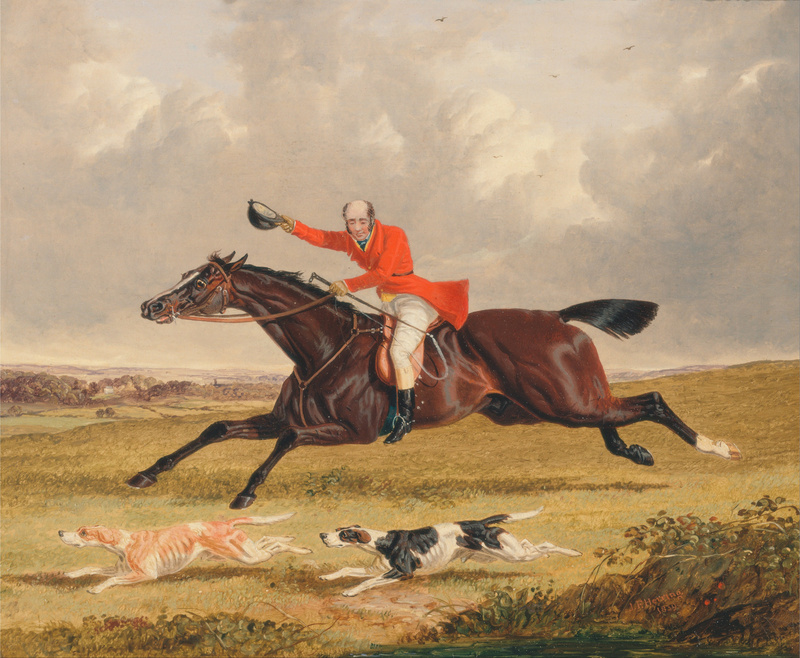 Outdoor sports like foxhunting, coursing, and shooting were popular pastimes of the 19th century country gentleman. As such, the care and maintenance of one’s hunting dogs was always a subject ripe for debate and discussion. What was the best feed to give a foxhound? How did one treat an outbreak of worms? And, most importantly, what was the ideal design and construction of a kennel? Sporting books and articles of the era give varying answers to these questions. Some of them fall in line with our knowledge of dogs today. Some of them are outright medieval. Either way, a bit of research reveals that, though his quarters may at times have been magnificent, the 19th century sporting dog was no pampered pet. In the early 19th century, the Duke of Richmond had one of the finest kennels in England, the building of which was designed by architect James Wyatt and rumored to have cost £10,000. The Duke of Bedford’s kennel at Woburn Abbey was equally luxurious, containing such amenities as flues running along the walls to preserve the temperature in the winter and a fountain in the middle of the yard at which the dogs could drink. But a 19th century gentleman did not require the wealth of a duke in order to have a pack of hounds and a kennel in which to house them. Some kennels could be built for as little as a few hundred pounds. 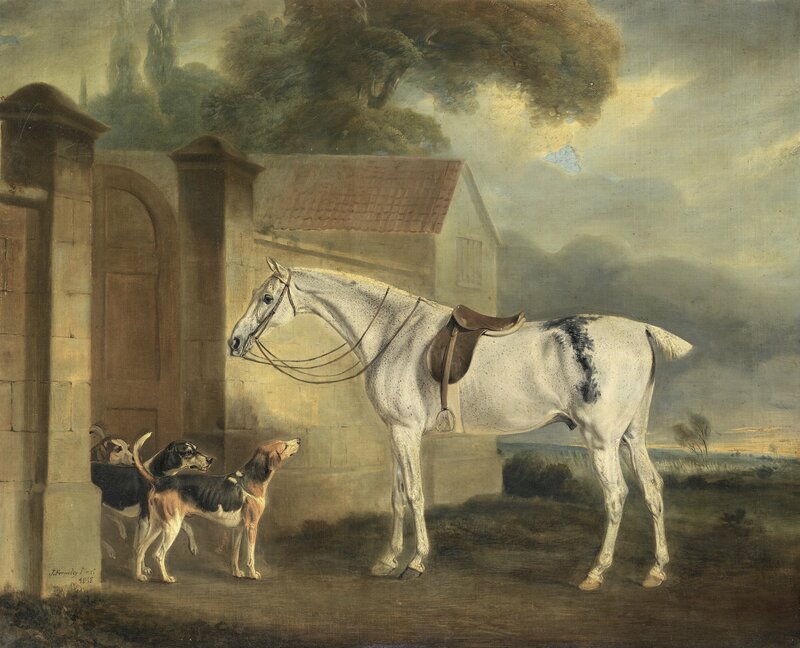 Learning About the Hounds by Thomas Butler of Pall Mall, 1750. Some gentlemen come into possession of a kennel already built, but those that contemplate new construction are advised by The Field Book to take “a previous survey of the most approved plans.” Amongst these are, naturally, the Duke of Richmond’s kennel at Goodwood, the Duke of Bedford’s at Woburn Abbey, and Sir William Rowley’s at Tendring Hall. These three kennels are held out as examples of construction where health and convenience were the primary considerations. 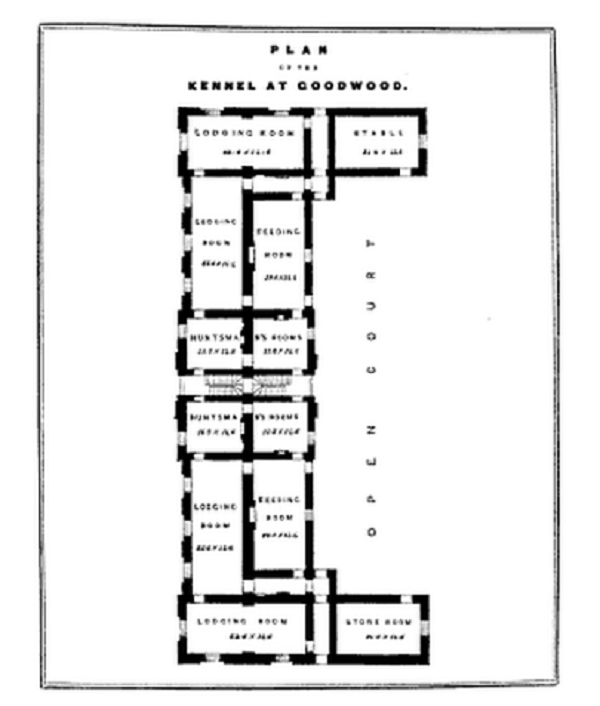 “Plan of the Kennel at Goodwood” from Sporting Architecture, 1844. 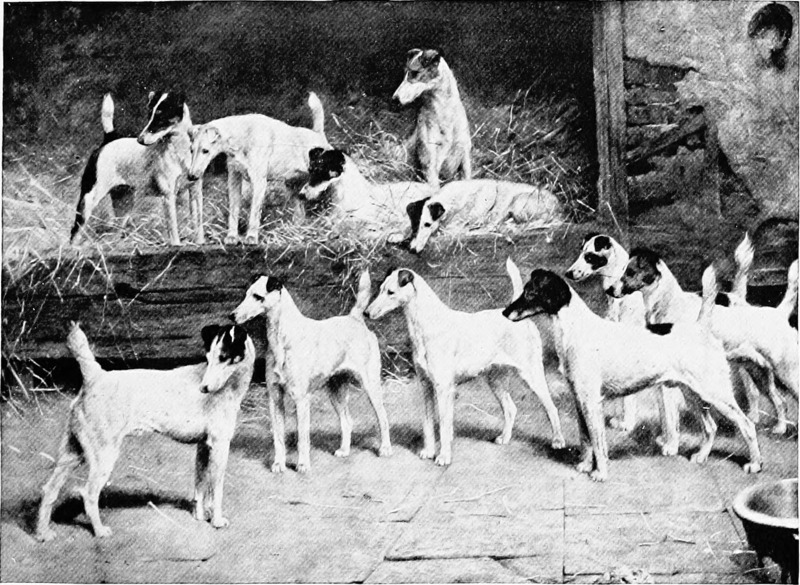 Fox Terriers in their Kennels from “The New Book of the Dog” by Robert Leighton, 1906. 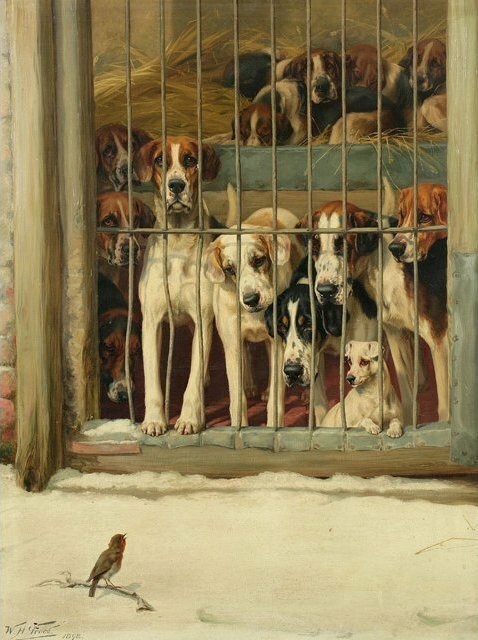 Hounds in a Kennel by William Henry Hamilton Trood, 19th century. As for meat, Cook also recommends boiling. However, he warns to beware of the vendor from whom one buys their horseflesh. According to him, any disease a horse may have died from may transmit to the dogs. He also advises to be wary of contaminated ingredients, referencing a recent report where flour had been adulterated with ground up bones and Plaster of Paris. A Couple of Foxhounds with a Terrier, the property of Lord Henry Bentinck , by William Barraud, 1845.
at John O’Gaunt’s Gorse, near Melton Mowbray by Richard Barrett Davis, 1836. 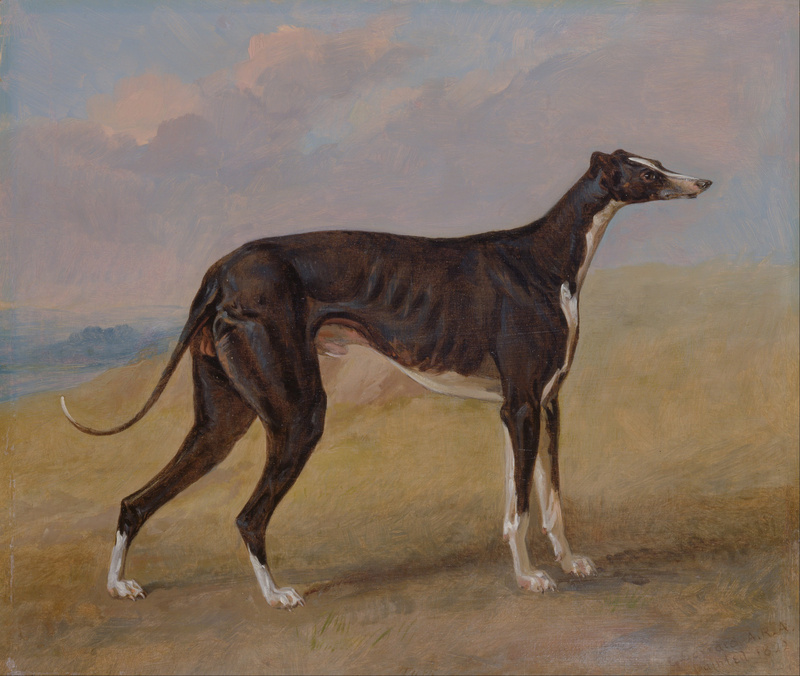 Turk, a greyhound, the property of George Lane Fox by George Garrard, 1822. This warmth is of such importance, that Tattersall advises that, ideally, a Greyhound kennel should be “heated artificially, and as regularly as if it were a conservatory (either by hot-water or a stove).” If this is not entirely possible, he has another recommendation. The Greyhounds might be kept in compartments adjacent to loose-boxes in which horses were kept. In this way, the heat from the horses would keep the temperature “just what it ought to be” for the Greyhounds’ comfort. 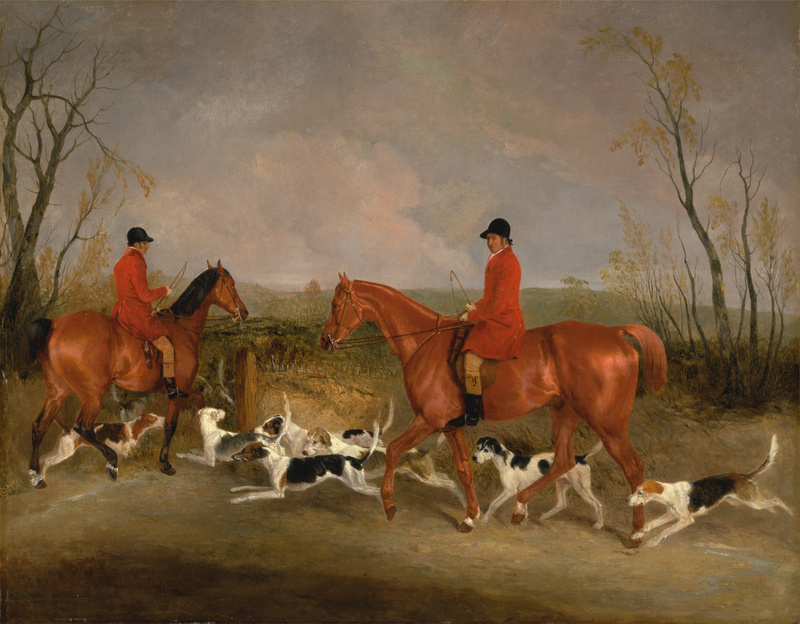 Thomas Wilkinson, M.F.H., with the Hurworth Foxhounds by John Ferneley, 1846. I will refrain from editorializing on today’s topic except to say that it is a subject of interest to me only as a student of 19th century history and writer of historical romance. I do ride, but not to the hounds and I have no plans to build a kennel for my pack of dogs. However, earlier this year when attempting to set a scene in one of my stories at the kennels adjoining the hero’s country estate, I found that there was not any easily accessible information about how kennels would function and look in that era. My subsequent research into 19th century texts was illuminating. Obviously, I have included only the minimum. You can find much more in the cited works below. I hope that, whether you are a historian, scholar, writer, or dog lover, you will find these facts as helpful as I did. BERNER: The man who feeds the hounds. He is outranked by both the Master of Hounds and the Whipper-In. COURT: An enclosed area or yard where the dogs can run. COVERT: A shelter or hiding place in the woods where a fox might be found. DRAW: To search for a fox in a covert. MASTER OF HOUNDS: The person who leads and is responsible for the foxhunt and to whom all the rest of the members of the hunt are subordinate. TALLY-HO: Shouted to make known the presence of a fox. WHIPPER-IN: A hunstman’s assistant who keeps the hounds from straying by driving them back with a whip into the main body of the pack. Brass, at Cottesmore with the Cottesmore Hounds by John Ferneley, 1818. Blaine, Delabere Pritchett. An Encyclopedia of Rural Sports. London: Longmans, Green, Reader, & Dyer, 1870. Cook, Colonel John. Observations on Fox-hunting and the Management of Hounds in the Kennel and the Field. London: William Nicol, 1826. Maxwell, William. Ed. The Field Book; Or Sports and Pastimes of the British Islands. London: Effingham Wilson, 1833. Tattersall, George. Sporting Architecture. London: Ackermann, 1844. Excellent post. Some of those sources are familiar to me (having come across them in researching the foibles of John Mytton, Regency sportsman) but some I hadn’t heard of. Glad to now have such a thorough bibliography on the subject, Mimi. Thanks Angelyn :) I’m glad you found it useful! 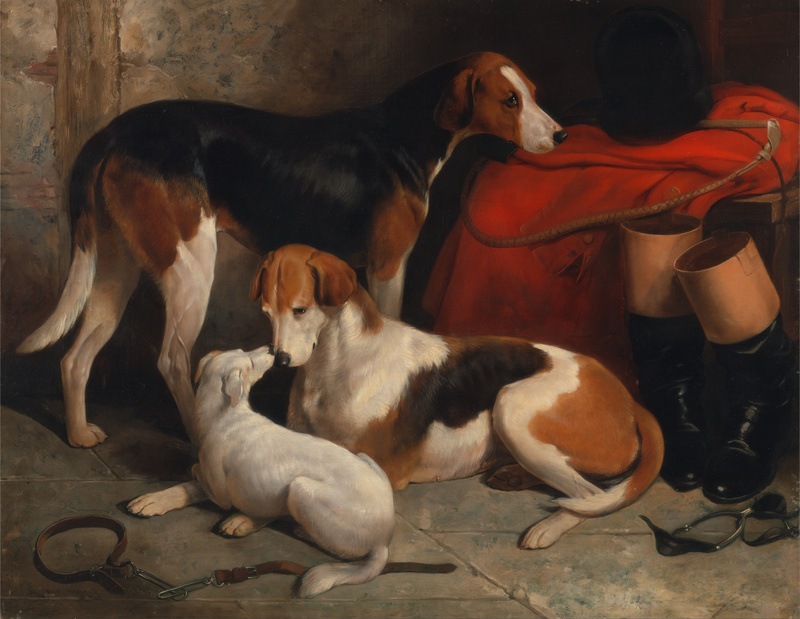 A wonderful article on my favorite subject – hounds! And thank goodness we have better ways to help our four legged friends now when they are sick! So glad you enjoyed it :) And yes, no more ground up glass! Thanks, Mimi, another informative post. 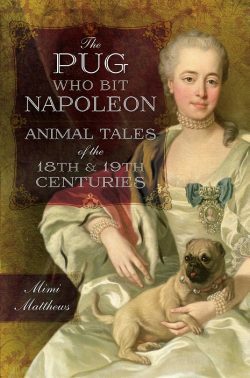 I keep threatening to write about sporting dogs usings Ackermann’s repository, but until I get around to it, it’s another source if you’re interested. I’m glad you found it useful, Sarah :) I did see some great Ackermann’s illustrations of hounds and spaniels in the field while I was researching. I almost put them in the article, but ran out of room! Thanks for commenting, Judith! So glad you liked my article. And I think you’re right, the basic kennel management of the hounds was probably not very different – though definitely methods of sanitation (and hopefully discipline and feeding!) would have been superior in the 1960s than in Georgian & Regency England. It is one of those areas of life so important in a historical novel and so difficult to accurately reconstruct today. Hopefully this article will help a little! I shall endeavour to start the research then. I am sure your father would have had many fascinating tales, Judith! I am glad it was drag hunting though. A historical question – hoping someone knows the answer. The sources agree that the silent dog whistle was invented by 1876 by Francis Galton. Yet, I find it difficult to believe that savvy hunters and dog breeders had never noticed before 1876 that dogs seemed to be sensitive to sounds inaudible to humans. For a historical article I’ve been working on, I have wanted to push the origin of silent dog whistles to an earlier date, but I have found nothing. Does anyone know some sources that would confirm that hunters knew about silent dog calls earlier than 1876?